Uneven illumination affects every image acquired by a microscope. It can bias image measurements and adversely affect quantitative analyses. Yet, the severity of the problem is underestimated by researchers, and the correction methods currently practiced are inadequate. Special calibration images are necessary to apply gold-standard methods, while alternatives contain modeling deficiencies. We proposed a principled illumination correction approach that outperforms even gold-standard methods on nearly all types of optical microscopy, and it is purely computational - it does not require any special calibration images. We noticed problems related to uneven illumination in images from high throughput screens performed at the Light Microscopy and Screening Centre at ETH Zurich. The example below shows a typical problem encountered in images from a high content screen. 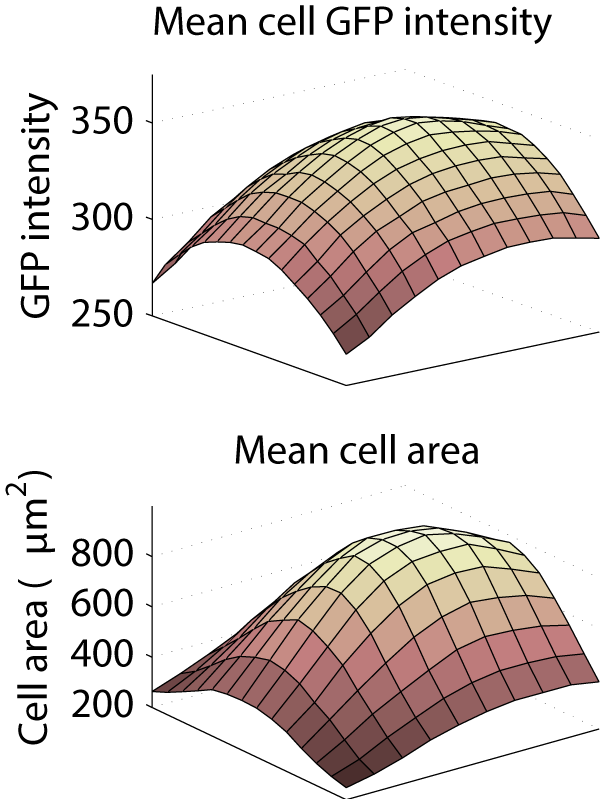 Illumination distortions in the GFP channel cause caused problems with the automatic cell body segmentation performed by CellProfiler - cell body segmentations in the center of the image expand beyond the membrane while segmentations in the corners of the image contract around the nucleus. 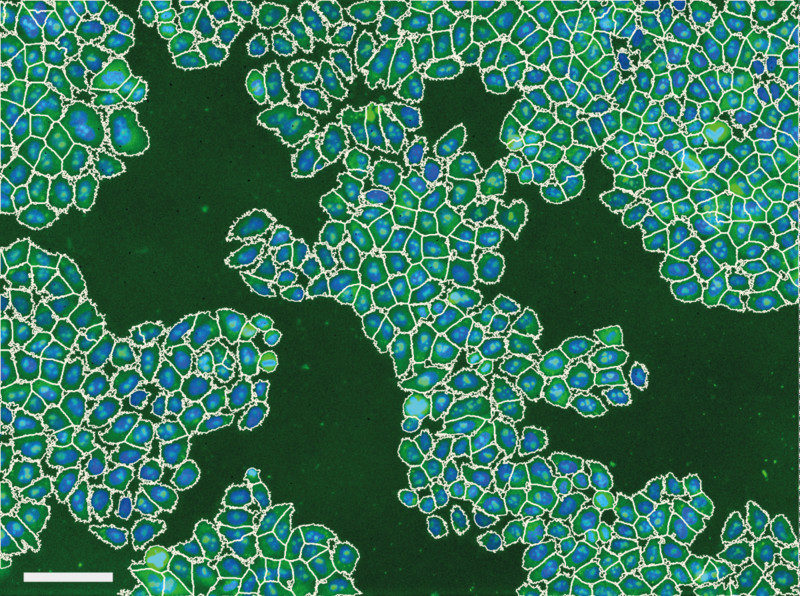 Typical effect of uneven illumination on the automatic segmentation of HeLa cells from a high content screen - cell segmentations in the center were enlarged while those in the the corner were shrunk. 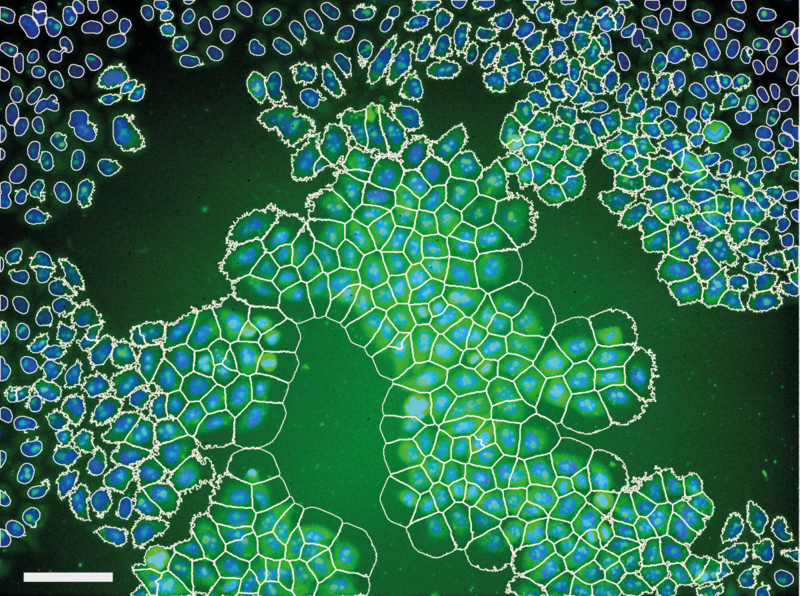 Measurements of GFP intensity and cell area throughout the screen were biased by the uneven illumination, yielding different values according to location in the image (larger, brighter cells found in the image center). This caused a substantial bias in measurements made from the images. Averaged across the entire screen, the cytoplasm was 26.5% less intense in the corner of the image than in the center, and the mean cell area was computed to be 896 μm2 in the center, but only 249 μm2 in the corner. Our investigation into illumination correction techniques identified 12 commonly used techniques, but the only reliable (gold-standard) methods require special images of a homogeneous calibration material such as a fluorescent reference slide or the culture medium to be acquired along with the data. 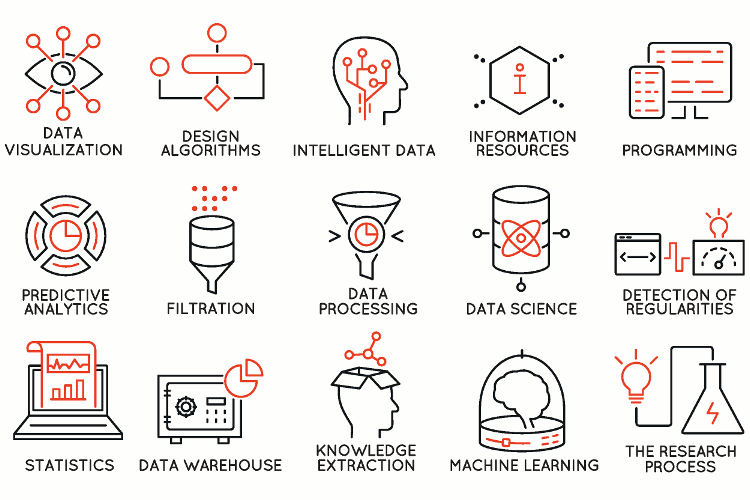 If such images were not acquired with the rest of the data, these methods cannot be applied. Furthermore, environmental changes or differences in properties between the calibration material and the specimen may throw off the correction process. We realized that most of the biologists and microscope users that we spoke to were unaware of the problems due to uneven illumination. We wanted to quantify this, so we created a survey that established the background of the microscopist and probed their familiarity with illumination correction. Some of the results of the online survey were very concerning! 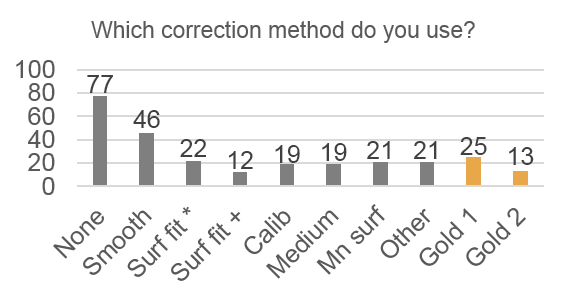 Most respondents were unfamiliar with the process for correcting uneven illumination. 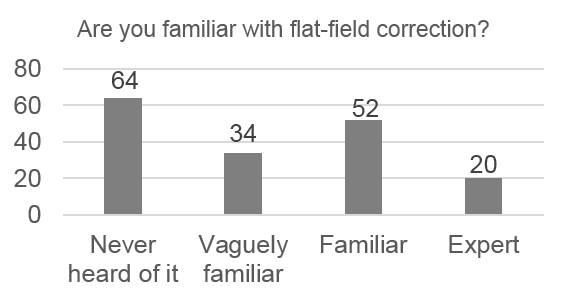 Most respondents used inappropriate correction techniques, or used none at all! 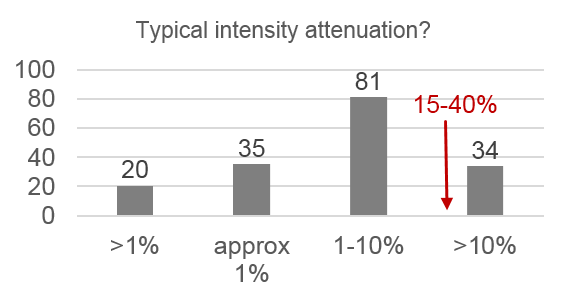 Most respondents underestimated the typical amount of intensity attenuation found in microscopic images (we estimate it to be between 15-40%). 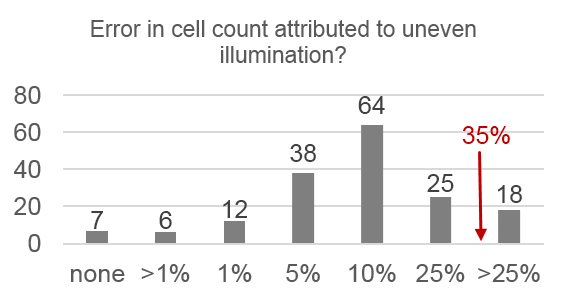 Most respondents underestimate the increase in error caused by uneven illumination when applying automatic cell counting to example images (the correct answer was 35%). We saw a clear need for a purely computational correction method that follows the same principles are the gold-standard methods but does not require any calibration images. Therefore, we developed such a method, correct illumination distributions with regularized energy minimization (CIDRE). 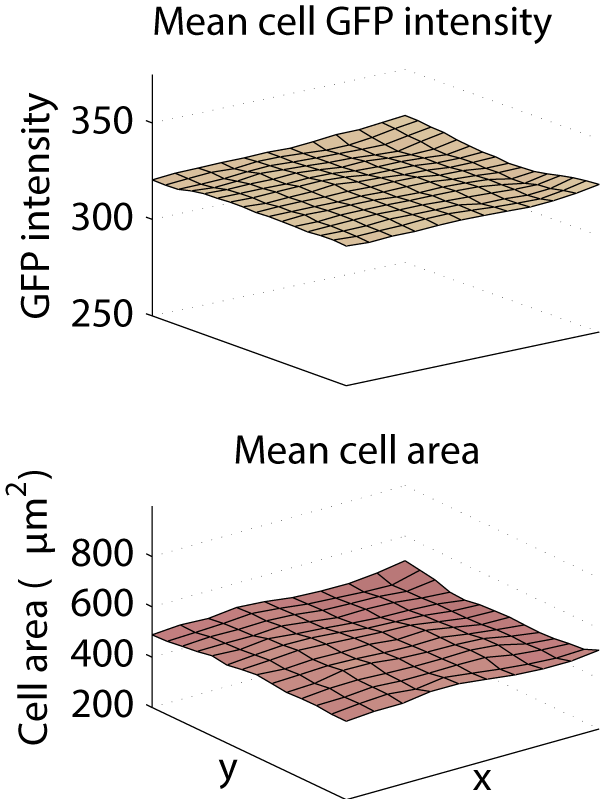 As demonstrated in the examples below, CIDRE reduced the intensity attenuation effect in our screens to less than 2%, and similarly curtailed variation in cell area. HeLa cell segmentations were able to properly localize the cytoplasm after correction using our method. Bias was successfully removed from measurements of GFP intensity and cell area using our method.